Click image above to download the full size poster! 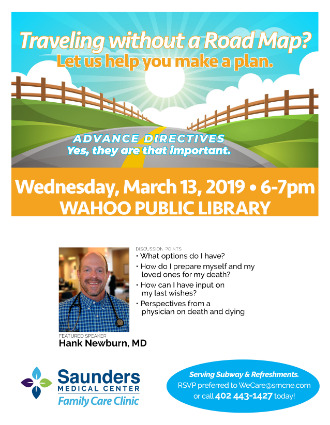 Come hear from Dr. Newburn about this topic and create a plan. Dr. Newburn is passionate about this topic, and so are our local EMS personnel who truly want to honor you wishes. 90% of people believe talking with their loved ones about end of life care is important, but only 27% have done so. Let's start the discussion. • How do I prepare myself and my loved ones for my death? • How can I have input on my last wishes? RSVP preferred to WeCare@smcne.com or call 402 443-1427 today! Serving Subway & Refreshments. Traveling without a Road Map? We will provide templates to help you create one!